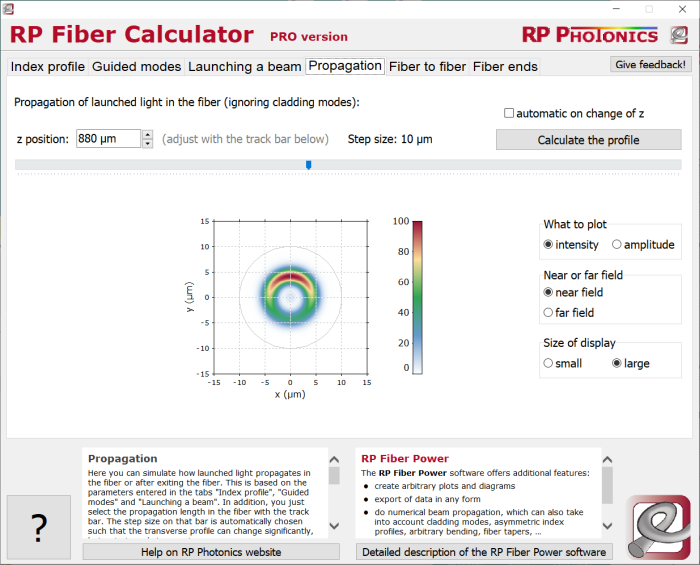 Here you can simulate how launched light propagates in the fiber or after exiting the fiber. This is based on the parameters entered in the tabs “Index profile”, “Guided modes” and “Launching a beam”. In addition, you just select the propagation length in the fiber with the track bar. The step size on that bar is automatically chosen such that the transverse profile can change significantly, but not strongly in one step. The calculation is done when you press on the button “Calculate profile”. If you have selected “automatic on change of z”, this also happens automatically when the z position is changed. do numerical beam propagation (as an alternative to the mode-based approach), allowing arbitrary index profiles, bending of the fiber, nonlinearities, etc. ultrashort pulse propagation with chromatic dispersion, a wide range of nonlinearities etc. Intensity or amplitude. In the latter case, the color codes the phase of the complex amplitude, whereas the intensity determines the color saturation. Near field or far field: show the profile in the fiber (in real space) or in the far field after exiting the fiber (with angular coordinates). Size of the display: use the smaller size for higher speed. If the diagram shows intensities, the used color scale is displayed in the form of a bar on the right side of the diagram. For complex amplitudes, the color scale is shown as a two-dimensional region. Note also that the color scale is automatically adjusted according to the peak intensity of the profile at the current z position. By clicking on the profile image with the right mouse button (PRO version only), you can call a context menu which allows you to copy the profile to the Windows clipboard. From the launch conditions, a complex amplitude for the excitation of each guided mode is calculated. At the requested position, the total complex field is calculated as a superposition of the contribution of all guided modes. (Cladding modes are not considered.) The intensity profile can be calculated from the amplitudes. For the far field, one takes the two-dimensional spatial Fourier transform of the field in the fiber. Note that the calculations need more time if the fiber has many guided modes. For few modes only, however, the used method is much faster than numerical beam propagation. On the other hand, numerical beam propagation (as offered by the RP Fiber Power software) can also take into account cladding modes, bending effects, nonlinearities etc.